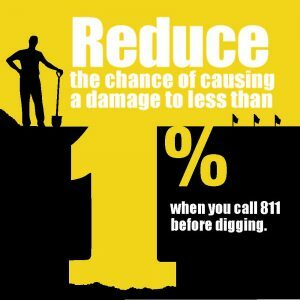 Did you know that according to the Common Ground Alliance (CGA), an underground utility line is damaged once every six minutes nationwide because someone decided to dig without first calling 8-1-1? 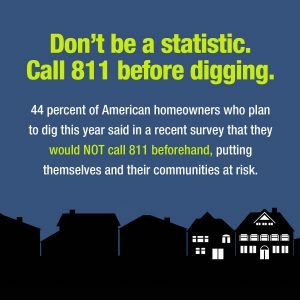 With spring finally blooming and construction projects beginning to increase, it is time to recognize April as National Safe Digging Month, which is a reminder to all residents throughout the United States to always dial 8-1-1 at least three business days before any digging project. This will mark the 10th Annual Safe Digging Month. Utility companies work with over 20 million miles of underground utilities in the country. 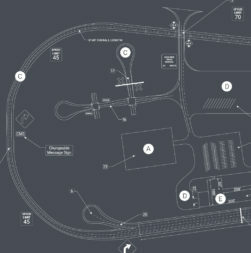 That figure equates to more than one football field’s length (105 yards) of buried utilities for every man, woman and child in the U.S.
Plan ahead. 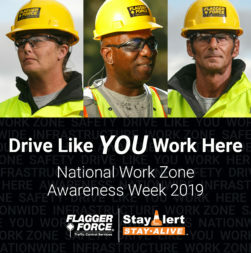 Call on Monday or Tuesday for work planned for an upcoming weekend — providing ample time for the approximate location of lines to be marked.